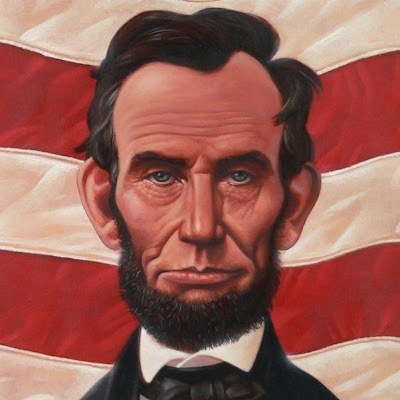 A new book about Honest Abe! I received two very cool books in the mail today, Abe’s Honest Words: The Life of Abraham Lincoln, written by Doreen Rappaport and illustrated by Kadir Nelson. And We Are The Ship, written and illustrated by Kadir (I already have this book, but shhh!). So what’s up with the Kadir books? I’ve been granted the honor of introducing or moderating his session at this year’s Texas Book Festival, so Jump At The Sun sent me his most recent books. Both books, of course, are nothing less than gorgeous. My favorite is a scene from Abe’s Honest Words that depict Black Union soldiers standing side by side, those who joined the army following the Emancipation Proclamation. The design of Abe’s Honest Words matches that of others in the series written by Doreen Rappaport — Martin’s Big Words and John’s Big Dreams (both illustrated by Bryan Collier). The covers have no text and feature large, close-up images of the subjects. The titles are on the back covers. The designer was a genious. Some have described Kadir as a modern-day Norman Rockwell. That may be true. But I think Kadir’s art and accomplishments stands on it’s own.